Heh, had a new spicy chicken biscuit and a hash brown from Mc Donalds this morning. Not that its funny or anything; but, I've had moments of chest pains for the last 3 hours. They go away after a while and after I've sat down to catch my breath. I found myself in the restroom earlier looking at myself in the mirror and I started laughing, how typical. Yeah, it's been a while since my last update. I've been feeling the frustrations of everyday life and have been dwelling heavily on the sad state of it all. Being the cancer that I am, I've reverted back into my shell. Only to surface here and there to go to work and go to Target to get my copy of Harry Potter and the Goblet of Fire on DVD. 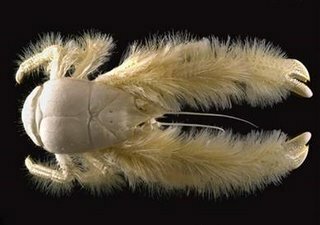 And speaking about shells, I heard about this the other day on the news on my way to work, about this new family of crustaceans living deep below the waters off Easter Island. Freakish looking thing if you ask me, and blind as a bat I heard. You can read the entire story here.